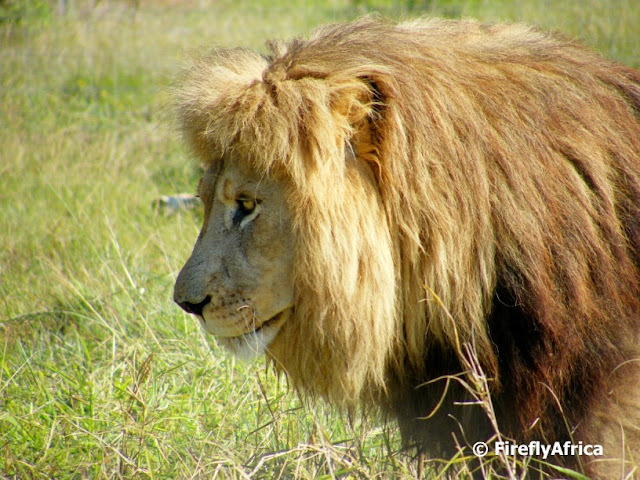 One of the adult male lions at Seaview Game and Lion Park. I was fortunate to be able to take this photo without any visible fence in it and what was even better was that he was standing still and focusing on something. I love this photo, even if I have to say so myself. Earlier in the week we had a nice hot day in Port Elizabeth and I decided to take a drive down to the beachfront during my lunch time. 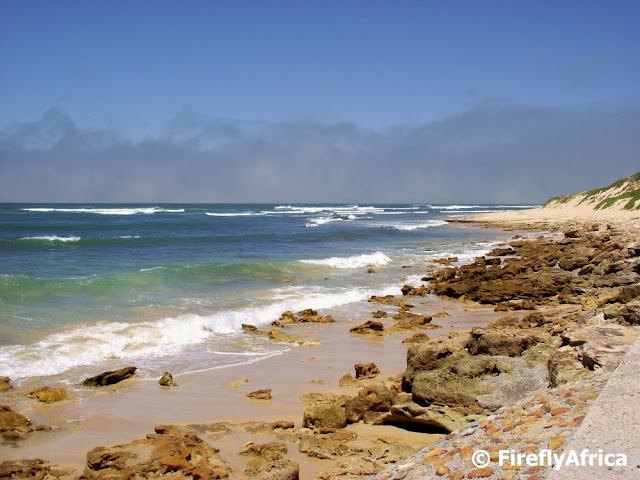 From the Flat Rocks parking area you could see a fog bank rolling into Algoa Bay as cooler air was blowing in from the Indian Ocean. It look like in the movies and I was expecting to see a ghost ship sail out of the fog at any time. Wouldn't that have made an award winning photograph! Just to end off the series of photos of the upgrade on the Donkin Reserve in the heart of Port Elizabeth I have decided to feature the biggest and most important attractions on the Donkin. The pyramid is the Donkin Memorial which was put up by Sir Rufane Donkin in 1820 as a memorial to his wife after which he named the city. The lighthouse was built in 1861 and also received a major upgrade as part of the project on the Donkin Reserve. 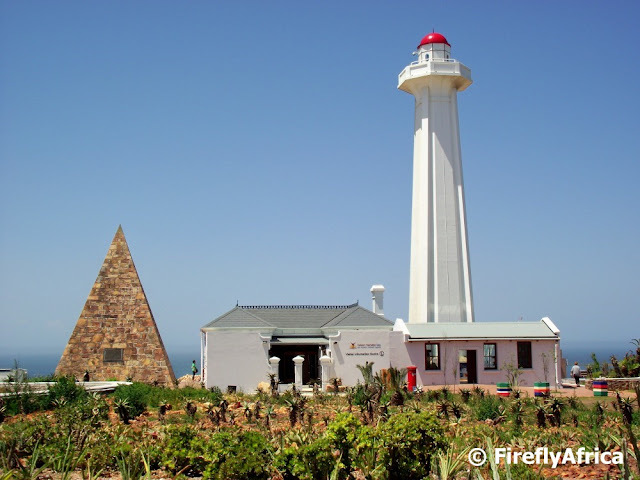 The lighthouse keeper's cottage is occupied by Nelson Mandela Bay Tourism and used as a Visitor Information Centre. On the northern side of the Donkin Reserve observers will notice what must surely be the first townhouse complex in Port Elizabeth. 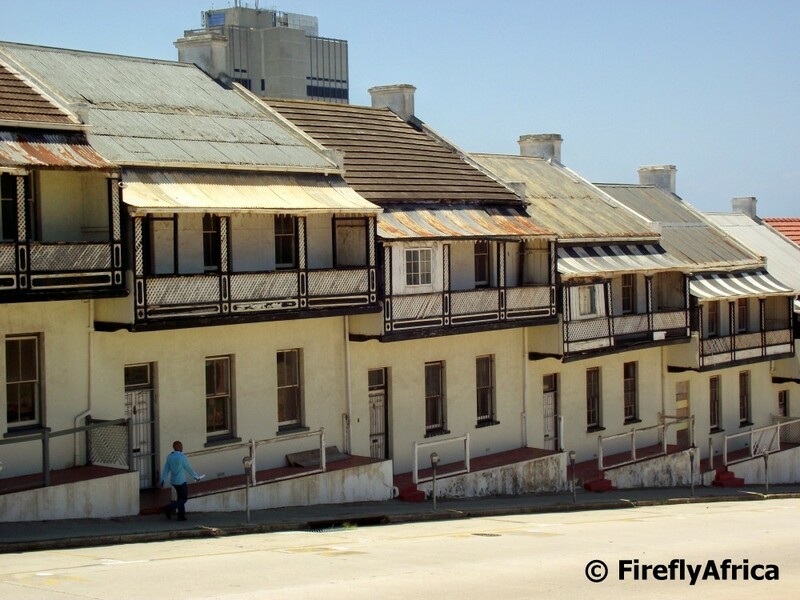 The Donkin Street houses were built between 1860 and 1880. Although each unit is one lever lower than the previous one, the house are all part of one structure. Sadly the Donkin Street houses has gone from one of the most photographed historic attractions in town to what it is today. 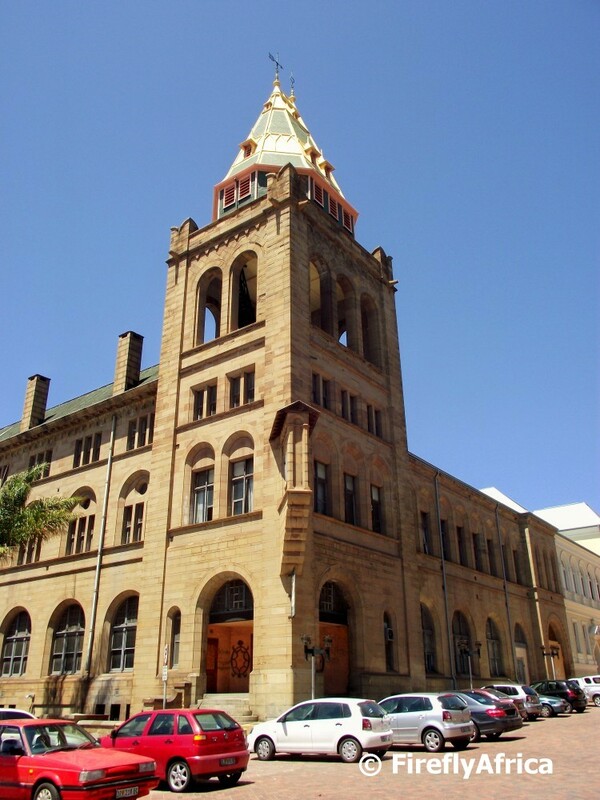 That is sadly what you get when you have buildings like these being bought by an overseas "investor" who doesn't seem to care much about the heritage of the city. But this blog isn't about naming and shaming, but rather about me saying that I hope sanity will prevail and that these beautiful buildings will be restored to their previous splendour. Specially in the light of the current Donkin Reserve upgrade. 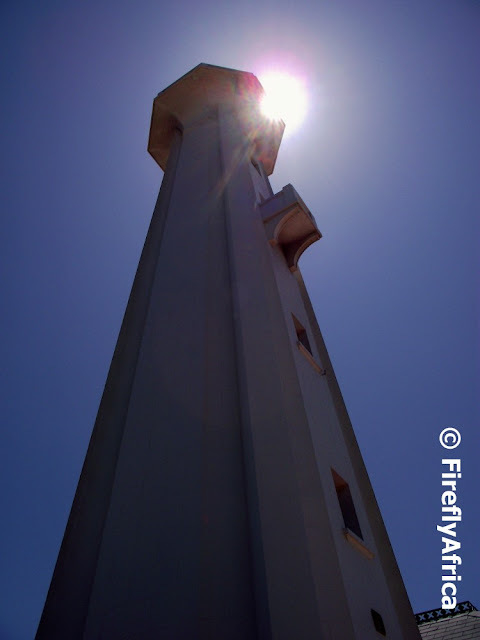 Seeing that I've been featuring the new art features on the Donkin Reserve I thought it would be appropriate posting a photo of the Donkin Lighthouse, Port Elizabeth's oldest lighthouse. Seeing that I have done a number of posts in the past with the lighthouse in them, I decided on a slightly different shot. The last of the art features at the Donkin I want to show you are the new row of seats for the tired and weary. 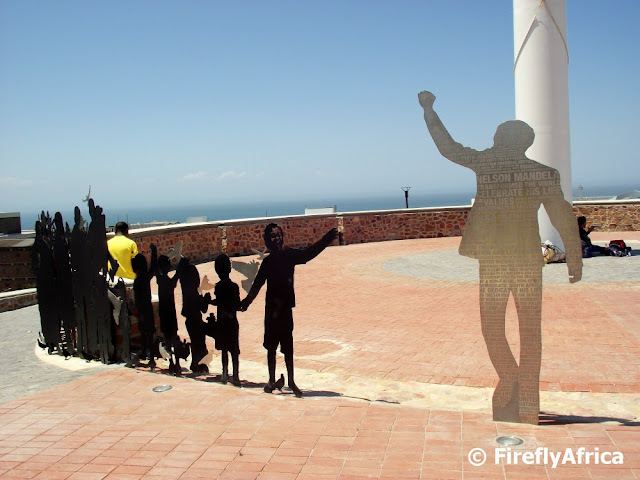 Perhaps its just my personal opinion, but out of all the art features being put up at the Donkin Reserve these must be my least favorite. They look like surfboards stuck in the sand and bending in the wind with the same kind of unappealing paintwork on them. The least they could have done is decorate them better. Like I said, not my favorite. 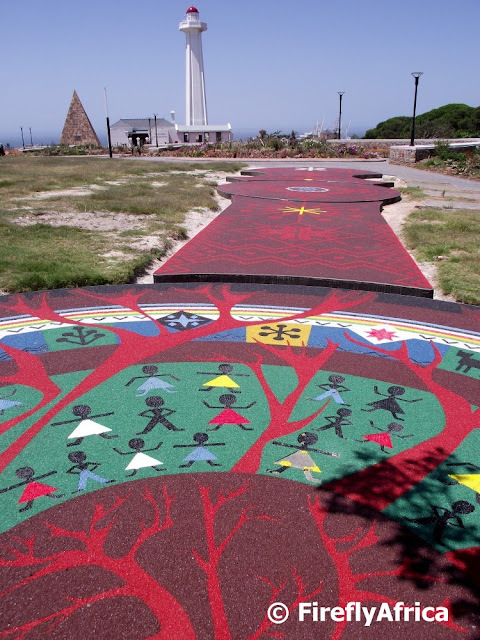 One of the new art features on the Donkin Reserve which seems isn't quite completed yet is the Red Carpet by designer Lisbet Demeyer. 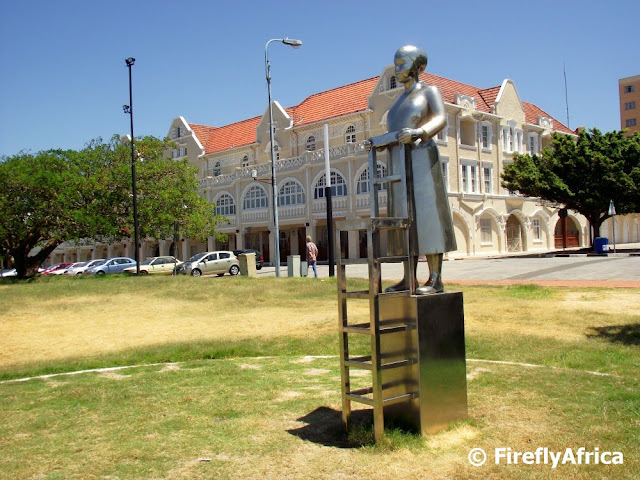 The Red Carpet starts on the side walk directly in front of the historic King Edward Hotel and in a way pulls the hotel's grandness onto the Donkin Reserve. At this stage I haven't found any information on all the symbolism of the Red Carpet, but I will do another post as soon as I get something more and the feature is completed. 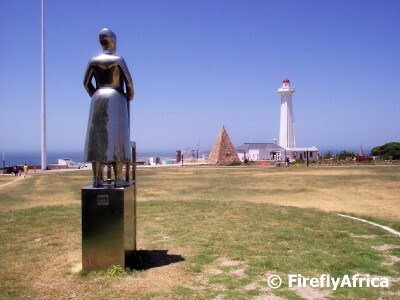 One of the most prominent of the new art pieces on the Donkin Reserve is the female figure gazing across the open space. The sculpture was done my well known Port Elizabeth artists Anton Momberg and was the first of the art pieces to go up. The building in the background is the historic King Edward Hotel. I took another angle from the back to show what the view to the other side looks like. A couple of months ago I took a similar photo at sunrise. 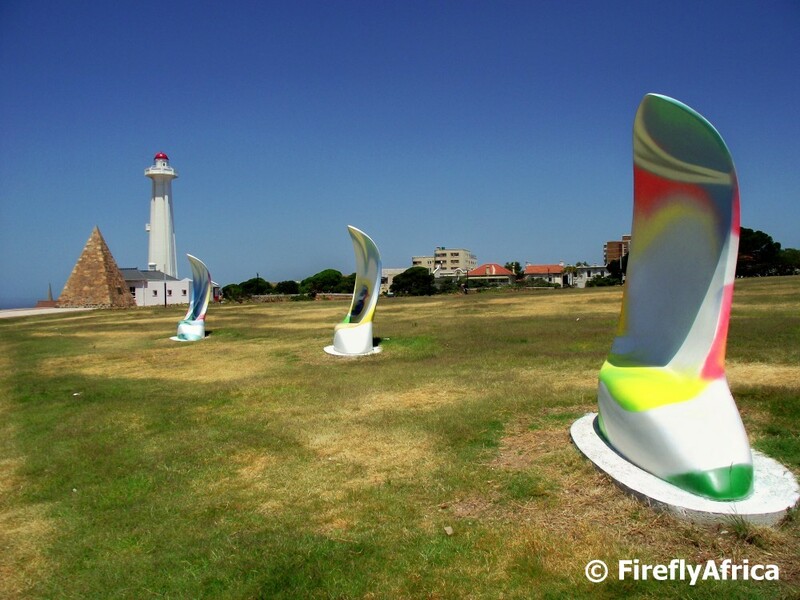 The third Donkin Reserve art piece in this series is The River Memory Piece which was created by Duncan Steward. The Donkin Reserve has been an official open space in the city since 1820 and originally a stream flowed down what is now Donkin Street next to the reserve. 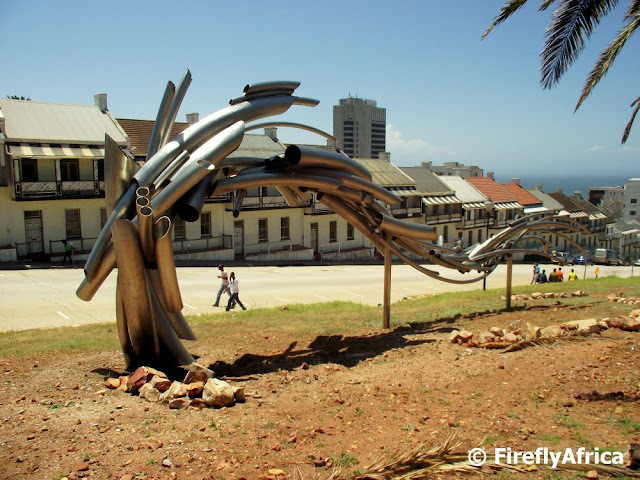 The idea of the art piece was to commemorate the natural environment lying beneath the recent layers of Port Elizabeth's growth. The second art piece on the Donkin Reserve I'm featuring in this series is probably the most unusual. 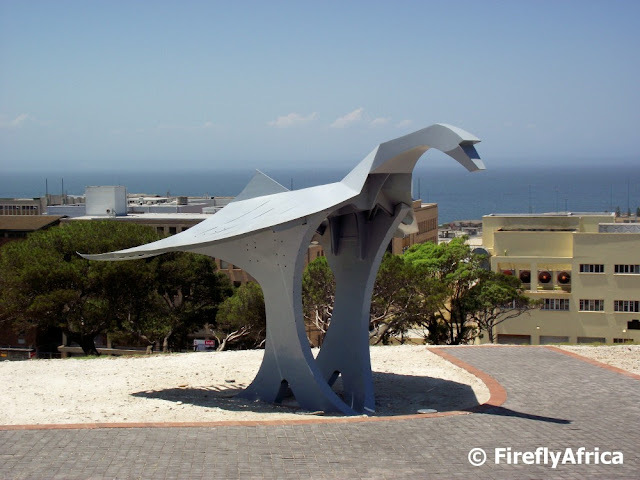 The piece was designed by published poet and former art lecturer Dolla Sapeta who was inspired by the birds that visit the Donkin Reserve as well as the sites view of Algoa Bay. The "Fish-Bird" is 3.8m high, has a wing span of 5m and stretches 6m from tail to head and has been situated slightly down the hill to hide it from most of Port Elizabeth's wind. A little while ago I said that I will do a series on the art pieces that is being installed on the Donkin Reserve here in Port Elizabeth. I popped down there this week and although the project isn't completed yet, got pics of all the pieces that has been done already. The art piece that I think will become the most popular attraction on the Donkin is the Voting Line. The Voting Line with its 59 life sized figures circles the base of the giant flag pole and at the front of it stands the figure of Nelson Mandela. 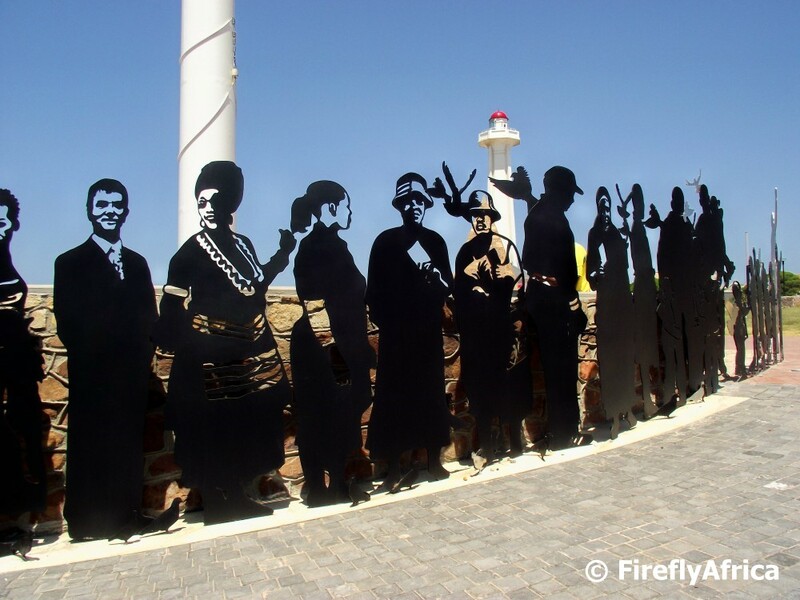 The figures in the Voting Line represents the demographic of the Eastern Cape and each figure was designed from a photo of a real person. 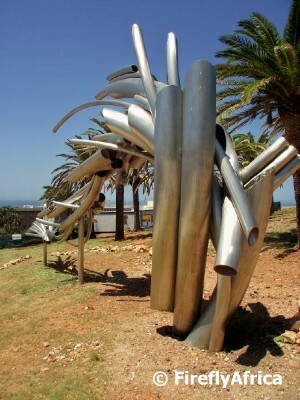 The art piece was the brainchild of artists Anthony Harris And Konrad Gee. Thanks to regular PEDP visitor Roche who reminded me of this very unknown monument. 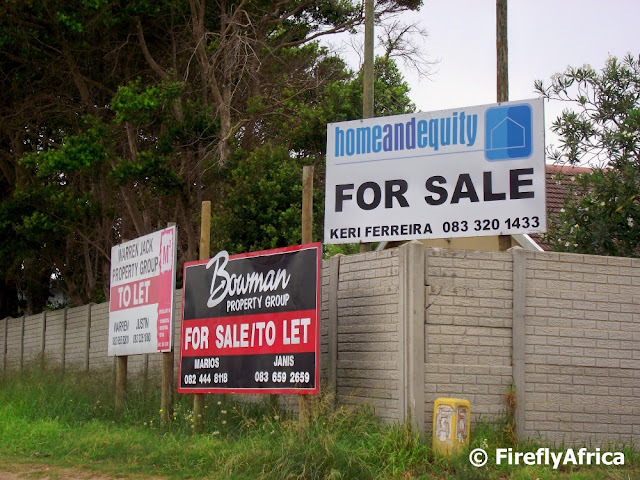 With the development of the Moffat on Main shopping centre on 17th Avenue between Walmer and Charlo recently, a lot of the property owners along the road has been trying to cash in on possible investors wanting to also develop in the area. Some of the properties along 17th Avenue has already been sold and a lot of them demolished, while others like the one above is still trying to be sold. I went to Greenacres and The Bridge Shopping Centre for the first time in ages on Sunday morning and snapped this pic from the windows on top of The Bridge. 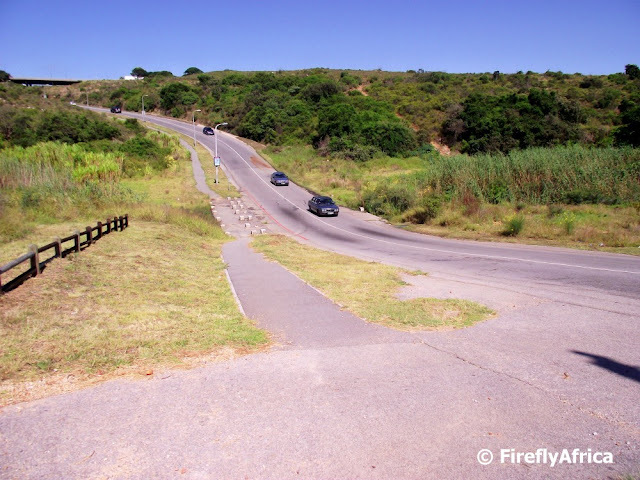 It looks down on CJ Langenhoven Drive going towards the Cape Road interchange. And before you ask why there are so few cars on the road, remember it was Port Elizabeth on a Sunday morning. 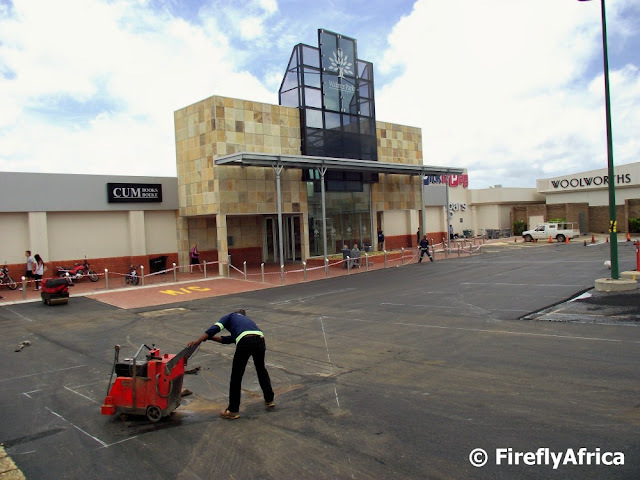 The Walmer Park Shopping Centre in Port Elizabeth recently completed a major upgrade which included an extension of its floor space and the addition of more tenants. One of the final phases of the project is the resurfacing of the parking area which was started before the building industry closed down for their end of year break and was completed last week. I was just wondering why they couldn't wait for another week for schools to start and did it while there was still lots of cars and shoppers about. Parking was quite hard to find with half the parking lot closed. I have to add though that it was done by the weekend and everything looks quite spiffy now. 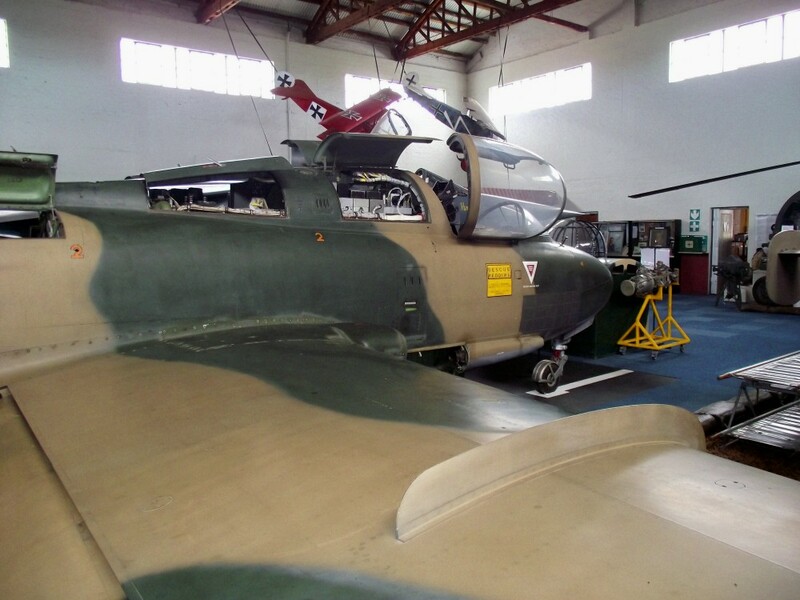 Next to the South African Air Force Museum building the museum also has a active workshop in one of the big aircraft hangers. Some of the planes in the hanger belong to the museum while others belong to aircraft enthusiast and is in for maintenance and repairs. I recognised one of the planes in the hanger (Bad Attitude, a Hawker Fury FB11) as one of those used during the recent Port Elizabeth Airshow and featured on Max's blog. 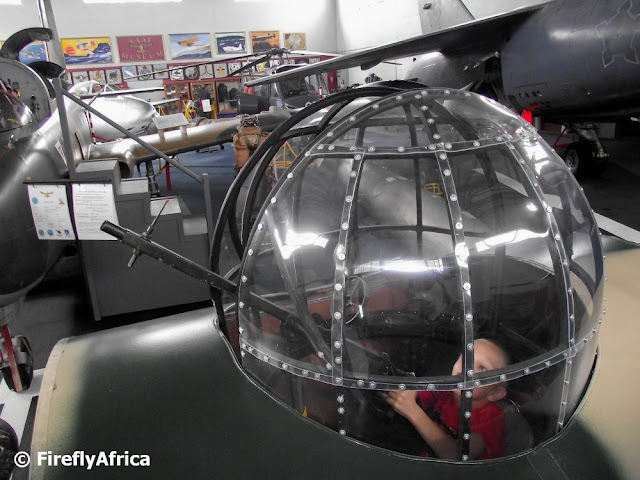 One of the new additions at the South African Air Force Museum in Port Elizabeth is a gun turret that was constructed for visitors, probably mostly the kids, to try out. They are also busy putting a flight simulator into the Mirage that is on display. Once that is up and running it should be quite awesome to try it out. One of Port Elizabeth's most under rated museums must be the South African Air Force Museum behind the Port Elizabeth Airport. 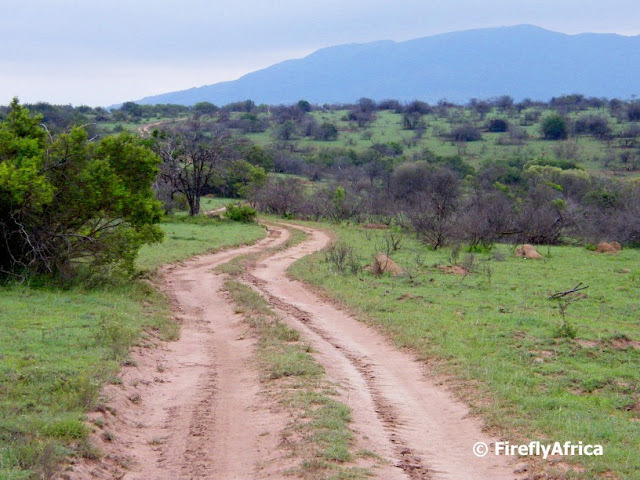 Its a little off the beaten track and to get to it one has to follow Forest Hill Drive around the airport perimeter which means not nearly as many people get there are it should. The museum has an fantastic collection of planes and helicopters and is surprisingly kiddie friendly. 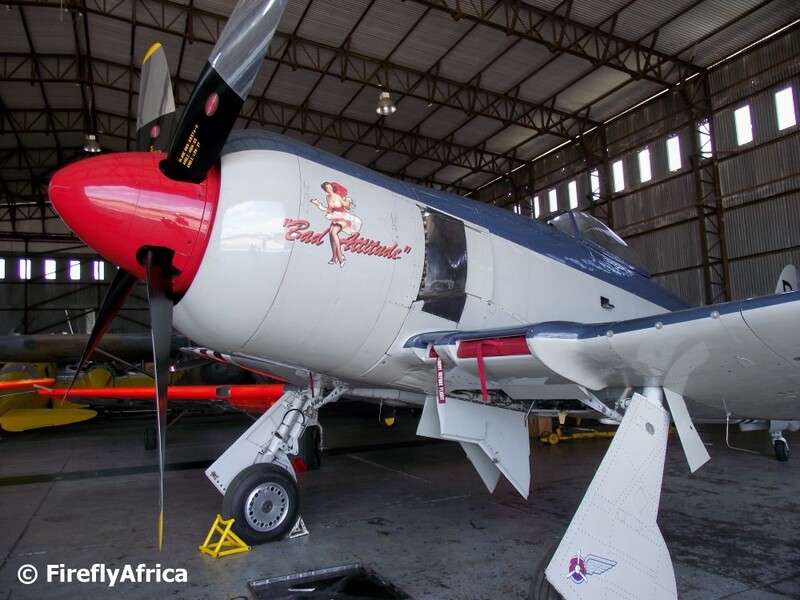 One of the planes on exhibit is the Atlas MB-326M Impala Mk1. 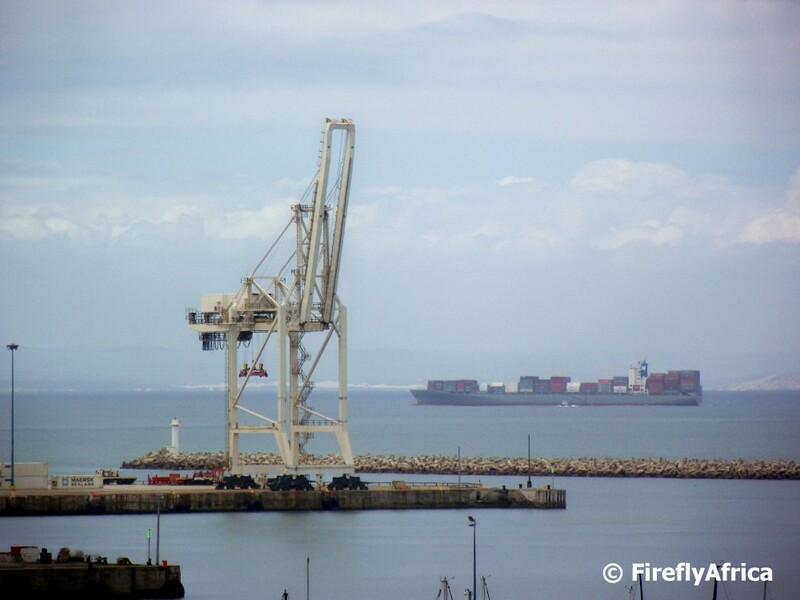 The first flight to land in Port Elizabeth, long before the airport was even built, was also the first flight to Port Elizabeth from Cape Town made by Major Allister Mackintosh Miller in 1917. 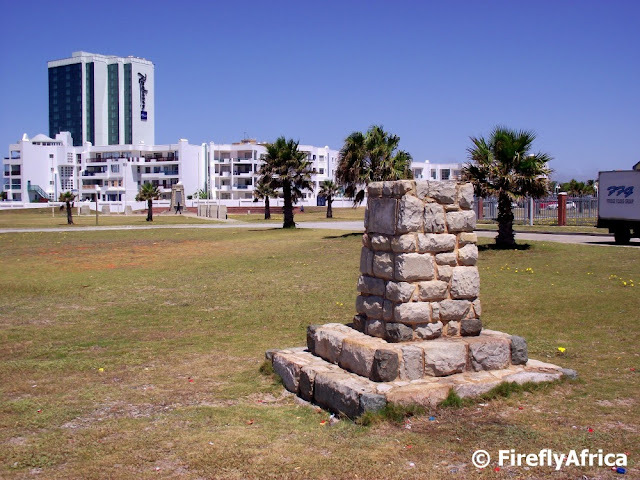 The Port Elizabeth Airport was established in 1929 and opened in 1936 and was founded by Lieutenant Colonel Miller who needed an airfield to operate his postal service between the city and Cape Town. During World War II, the airfield was extended to accommodate 42 Air School for the Royal Air Force and 6 Squadron South African Air Force on the southern and eastern sides of the field. Commercial operations were conducted from the northern side. Construction of the permanent terminal buildings, runways and an air traffic control building began in 1950. The commercial operation was moved to an airfield at St Albans, some 25km from the city centre, for the construction period. The new buildings were officially opened in 1955. In 1973 the apron was extended to accommodate larger aircraft and a new departures terminal was opened in 1980. The airport has three runways. The main asphalt one 08/26 is 1,980m long, the second asphalt one 17/35, 1,667m long and the third grass one is 1,160m long. 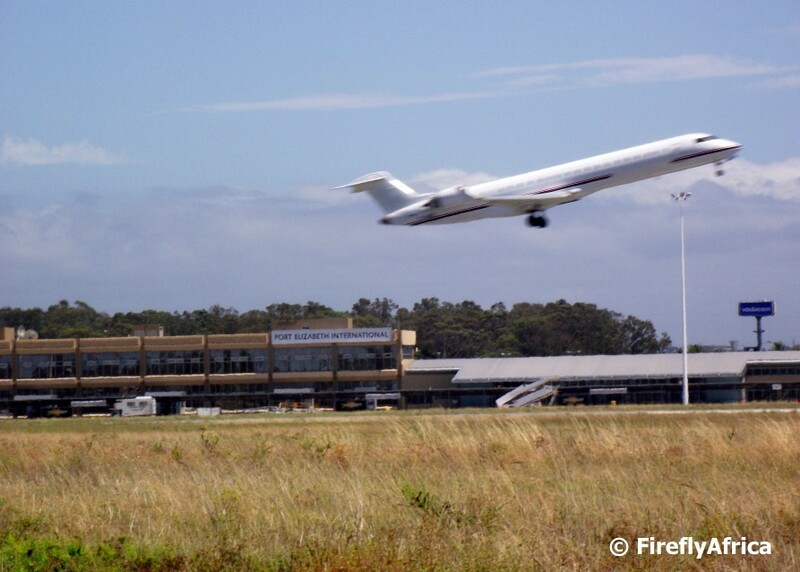 There are also 13 aircraft parking bays on the apron and the terminal building measures 8,700 square metres. This facility caters for domestic flights but can be screened off to operate a fully compliant International arrivals and departures section. Another post featuring the 3rd Avenue dip between Newton Park and Mangold Park. The low water bridge at the bottom of the dip is often submerged after persistent hard rain and flooding. 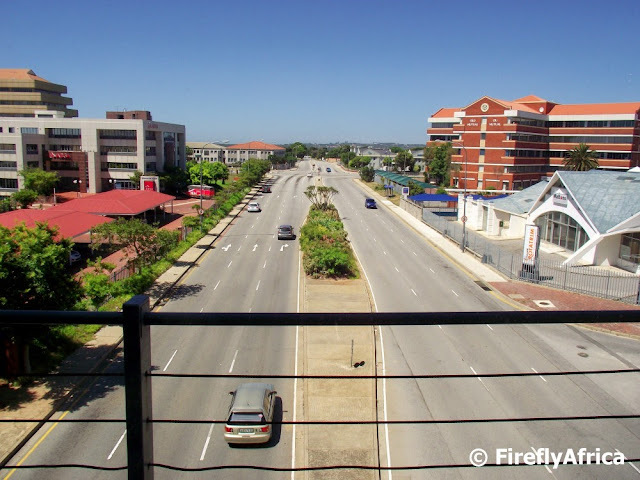 Everybody in Port Elizabeth knows the 3rd Avenue dip. 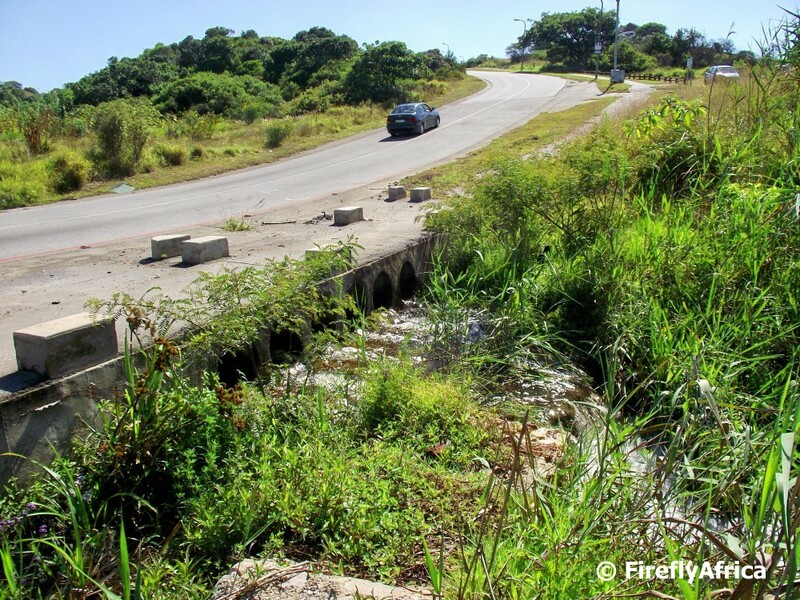 It is where 3rd Avenue, Newton Park crosses through the Baakens Valley and before the construction of the William Moffat Express Way it was the main access road between Walmer and Newton Park. The 3rd Avenue dip was built in 1957 and still is a very popular road used as an alternative to William Moffat. 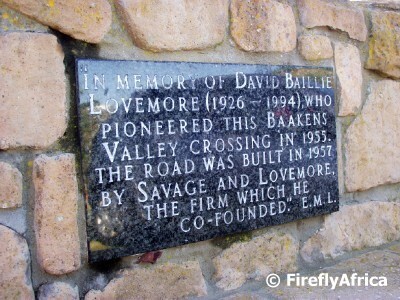 Very close to the low water bridge, which is often under water after big rains, stands a bench as a monument to David Baillie Lovemore. Lovemore was the person who pioneered this road through the Baakens River. Now there's a fact I bet the PE folk didn't know. A passing shot (and not the first I might add) of the Rudolph Street Mosque in South End. I think its time I stopped there one day and have a proper look around. 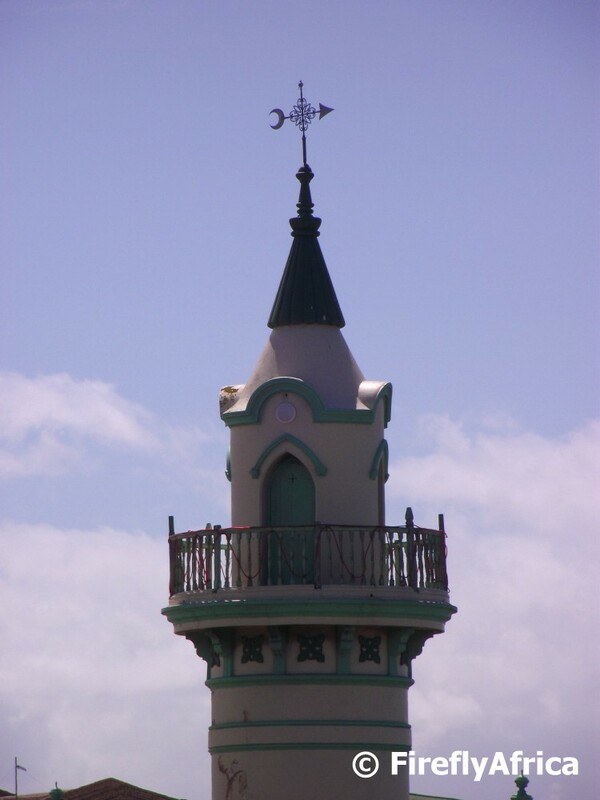 The mosque was completed in 1894 and is one of the buildings that was spared when the rest of South End was being demolished. One of the older features on the Port Elizabeth beachfront is the Tin Hat next to Humewood Beach. It's been around for yonks and I am sure it has some kind of significant meaning. Unfortunately there is no plaque on it (anymore) and I couldn't find any information other than references to it on the internet. My guess is that it has some relevance to the Order of the Tin Hats, but I don't want to assume without any facts. If I do find something, I will update the post with it. The Tin Hat on the beachfront has got nothing to do with the Moth, isn't a memorial neither does it have any military significance. 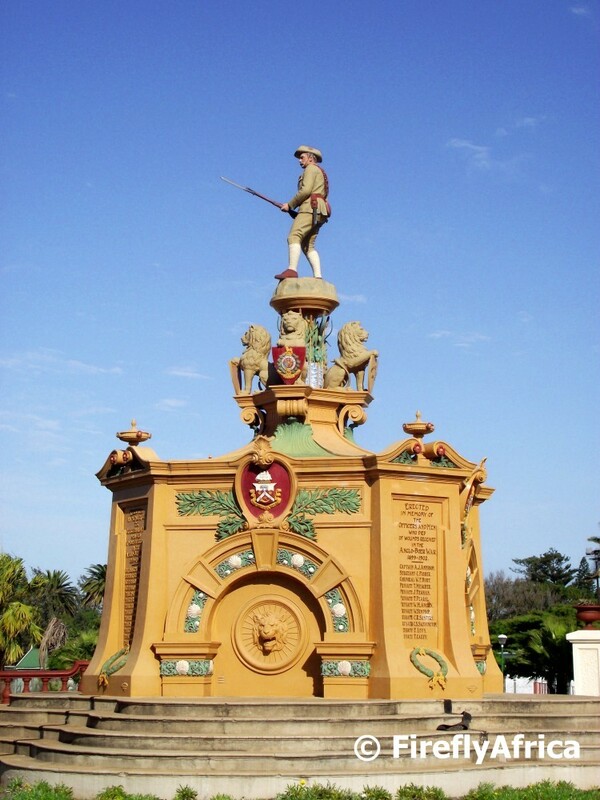 The Governor General of the Cape (Prince Arthur of Connaught as well as Princess Arthur) paid a short farewell visit to Port Elizabeth in 1923. On this occasion Prince Arthur opened the Campanile and laid the foundation stone of the First Scouts Hall in North End. Princess Arthur opened the "Princess Promenade" in Humewood which was built in sections over several years. The official opening took place under the Promenade Dome, designed by the Assistant City Engineer JJ Burt, on 6 November 1923. 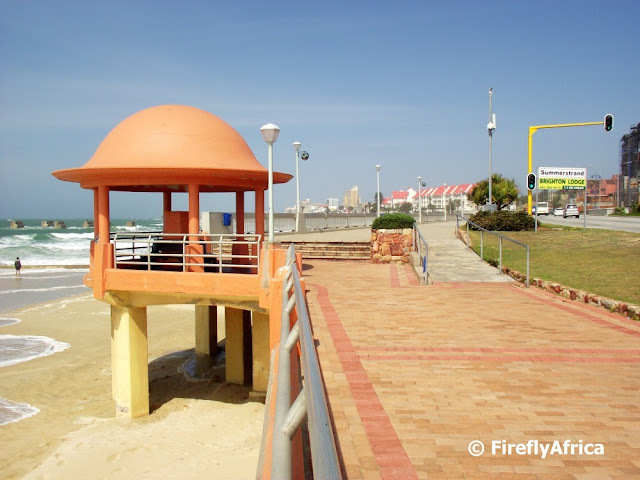 The Promenade Dome is commonly known as "The Tin Hat" from its resemblance to a First Word War helmet, but couldn't have had any connection to the Moth order as it was only founded in 1927. A bronze plate was affixed to commemorate the occasion, but this has been long gone of course. Credit to the details above goes to Margaret Harradine from her wonderful book titled "Port Elizabeth - a social chronicle to the end of 1945". ANOTHER UPDATE: The Promenade Dome has a twin in the De La Warr Pavillion Bexhill on Sea Sussex in the UK. 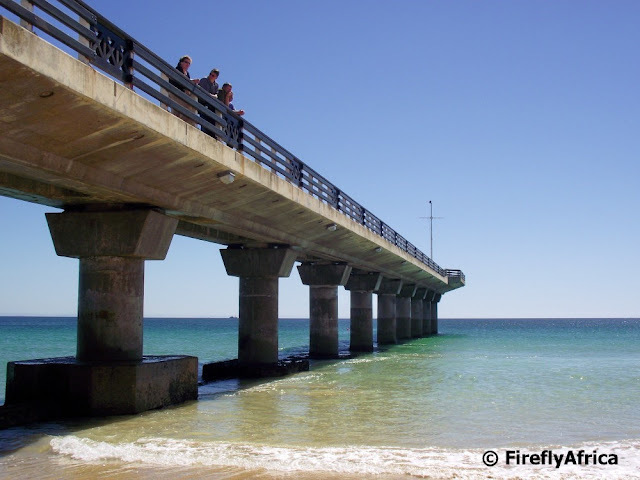 Pollok Beach (often also spelled Pollock Beach) is seen as one of Port Elizabeth's main beaches, but is probably the one that is least frequented by bathers. Although the beach is guarded by the very efficient Summerstrand Lifesaving Club, it tends to be a bit on the tricky side as it often has rip tides. So the important thing to remember when swimming here is to stay within the lifeguards' demarcated area. 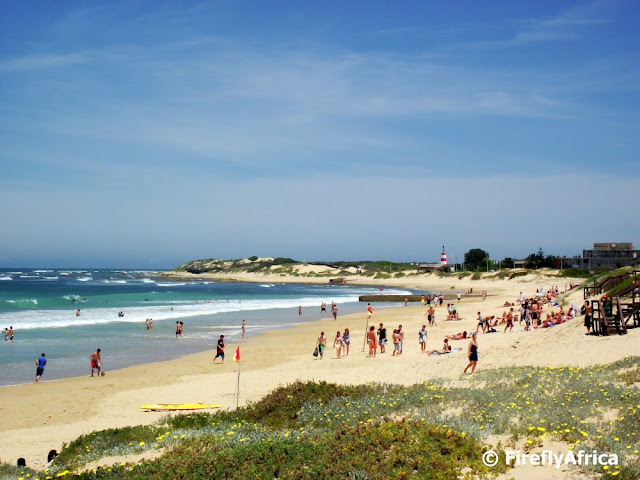 The Pipe surfing spot next to the main swimming area is probably Port Elizabeth's most popular surfing beach though which means that there are always quite a few people on the beach. I just love the Prince Alfred Guard Memorial in St Georges Park. It has a certain something to it. I always find a new angle I haven't used or a feature I haven't seen before. 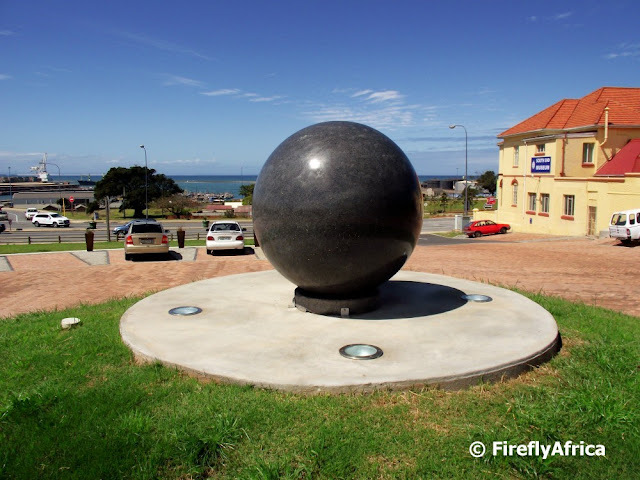 This photo is just a straight face on photo of the memorial which was erected in the memory of the men from the Prince Alfred Guard Regiment that has died in four different wars. One of them being the Anglo Boer War. 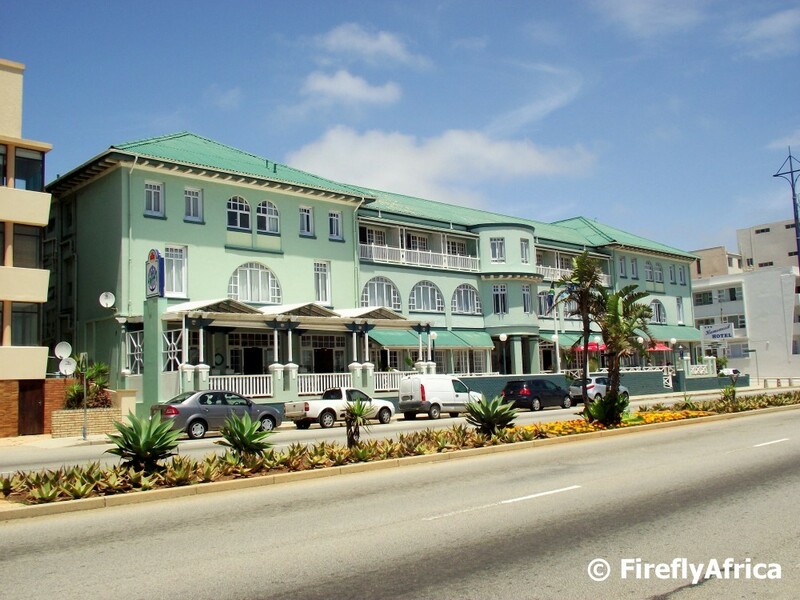 The 3 star Humewood Hotel on the beachfront must truly be one of the most under rated hotels in Port Elizabeth. When you ask anybody to name hotels in the city, you can bet that the Humewood won't be very high on the list. Its probably because its one of the grand old ladies of the city's accommodation industry and doesn't look modern and fancy, but it doesn't have to be. Over the last 10 years or so the SAGA Holidays group in Britain has voted the Humewood Hotel as one of the top 10 hotels it offers its guests. Most of the other hotels are 5 star resorts in exotic destinations all over the world which just shows that nothing beats good ol' service and value. Its definitively a feather in the hat of GM Dave Snuggs and his team. A closer shot of the granite ball situated on the new parking area of the South End Museum (see here). The ball is one of the 2010 FIFA World Cup legacy projects that were identified before the World Cup. It is felt by a lot of people that too much money was waisted on this and that the money could have been better spent somewhere else. I think the only way to really make it work for the city is to make it a monument to a succesful 2010 FIFA World Cup that was staged in the city. Something for people to remember the World Cup by. Happy New Year everybody. Another year has seen its backside and with that a new year is wiping its feet on the welcome mat. I hope there isn't too many aching heads today and that everybody partied the new year in responsibly. Here is to hoping the the year (and path - see how it fits in with the picture) ahead is a wonderful and prosperous one.